Sometimes its nice to just take a break, you know? I am happy to be back and to share with you a few things I have learned since the last time we spoke. The reason why I have been so MIA lately was because I had been practicing for a cooking show competition and had to travel to LA to compete. Basically, I made it to the top 78 of a super popular cooking show. Unfortunately, I did not make it on to the actual show, however I did learn a few things along the way. Let me start by saying I made so many new friends and it was so refreshing to be around people that understand me and my passion. I mean like, that’s the best, right? A forum where you can be around like-minded people who understand the journey you are going on…a place to ask questions, learn more, and most importantly cook! Sweet and Masala, at first, started out as a food blog only and evolved into a lifestyle blog as I began exploring new things in my life. One thing that has remained constant is the food. I LOVE food. I love to eat and I love to cook. I adore hosting and watching how people can get so happy around a table. That’s why I do it. Going on this journey to compete on this show gave me so much more clarity and confidence in who I am a home cook and what I want out of life. I sort of had the “ahah!” moment, you know, that moment that everything clicks. I wanted my food vision to be Indian-Fusion food, which, to be honest, I wasn’t really producing. I didn’t know what that meant to me. After meeting other home cooks and talking with them I finally realized what my fusion is. Fresh, seasonal, ingredients combined with the flavors of India. After writing it, that seems very obvious. I just wasn’t sure how to do that, or how to do that well. I’m actually still not 10% sure, BUT I now know I am on the right track to achieving it and I can’t wait to share my thoughts and new flavors and food combinations with you! Moral of the story, as cheesy as it may sound, is to follow your dreams. One dream may roll into another, which may turn into something brand new! I mean, who says you can only have one dream? Who says you can’t change your mind? I thought I was going to get on this show, win, and then change my whole life. Sometimes what you want isn’t the cards you have been dealt. You gotta just keep moving, reshaping and evolving. Who knows, you may surprise yourself? 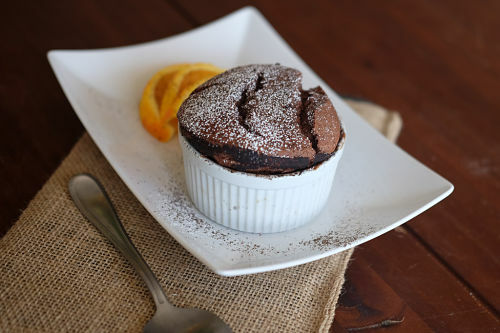 Now go enjoy this super chocolatey, rich and decadent Dark Chocolate, Chili and Orange Soufflé! Rich dark chocolate ganache with a fiery hint of chili powder and sweet orange. Preheat oven to 400F. Butter 3-4 ramekins on sides and bottom and lightly coat the whole surface with dark chocolate powder, tapping to remove excess. Place on baking sheet and set aside. Break chocolate pieces and place in a bowl. Add the juice of one orange and the chili powder and set aside. Heat heavy cream until scalding and pour over chocolate. Let sit for 3 minutes, then stir to incorporate until smooth and set aside. In a small saucepan add butter then slowly add in flour until the mixture has thickened over medium. Once the mixture is browned slowly add in the milk continuously whisking until the mixture is thickened into a custard like consistency. Whisk egg yolks and sugar together. Add 3 tbsp. of the flour mixture to the yolks and whisk to temper. Once incorporated add egg yolk mixture to the flour mixture and stir until incorporated and smooth. Add to the chocolate mixture. In a mixer add egg whites and beat until stiff peaks. Using a rubber spatula add a ¼ of the egg yolk mixture into the chocolate mixture and STIR to combine. Continue to FOLD in 1/3 of the egg white mixture, one scoop at a time until combined. It is very important not to overmix, or your soufflés may not rise. Divide the batter between each ramekin and fill to the top. With the back of a knife wipe away any excess from the top. Using your thumb create a ring around the top of the batter in a circle to create a ridge for the top of your soufflé to rise and to wipe away any excess cocoa at the top that will prevent the soufflé from rising. Bake for 11-16 minutes, or until raised and the tops feel firm. Once baked dust with cocoa powder, powdered sugar and orange zest. Do not continuously open the oven as the temperature drop will affect the rise. Be sure to clear away any excess debris from your ramekin. Serve with whipped cream or a crème anglaise. Enjoy! So proud that you took the step, followed your dream, and just went all in. I’m sure this one step will lead to so many more opportunities! ???? Thanks Sheets, can’t wait to see you tomorrow! Wow! Congrats on making it to the top 100. Sounds like an amazing experience and what a great opportunity to meet like-minded people. I’m glad you’ve been able to find your own style of cooking and I’m excited to see more delicious fusion recipes from you! Thank you so much! Maybe next year! These look so good. I am going to be craving these all day now! They are V crave worthy. Make sure you get your chocolate fix! I loved cooking with you! We made an awesome team ❤️ You are so positive and uplifting Kayla! How fun to make it that far to a cooking show. Keep pushing! Dessert looks fabulous. Looks so good! I need to try this! The top 78, that’s amazing! I bet there were thousands of people! This recipe looks amazing, you make such creative food, I love it! What an amazing opportunity! I love the recipe that you shared and I think it’s a nice twist on the usual chocolate souffle. It’s really awesome that you learned so much from the experience and that it gave you motivation to achieve more. Great that you worked out so hard in the fusion recipes, the outcome is really amazing, ORANGE SOUFFLÉS look so tempting that I wish to grab immediately! Oh wow this looks sooooo good! 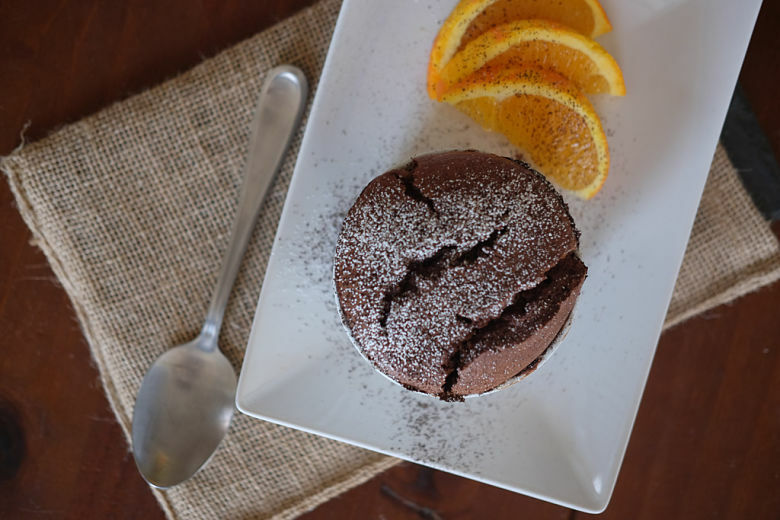 I love chocolate souffle but with the orange I bet that’s such a great combination! First step is always taking the courage to take the first step and you have done it! With a mouth watering souffle at that! Even if you didn’t make it, congratulations still. You’re on the way to greatness. You are already a winner for trying-out.. sometimes its not all about winning but what you gained in the process. am sure going to try this someday. Nice. yum yum yum ..this is so good and apparently easy also. The best part is I would have all these ingredients in my fridge, so even better to make. As years have past, things have changed. 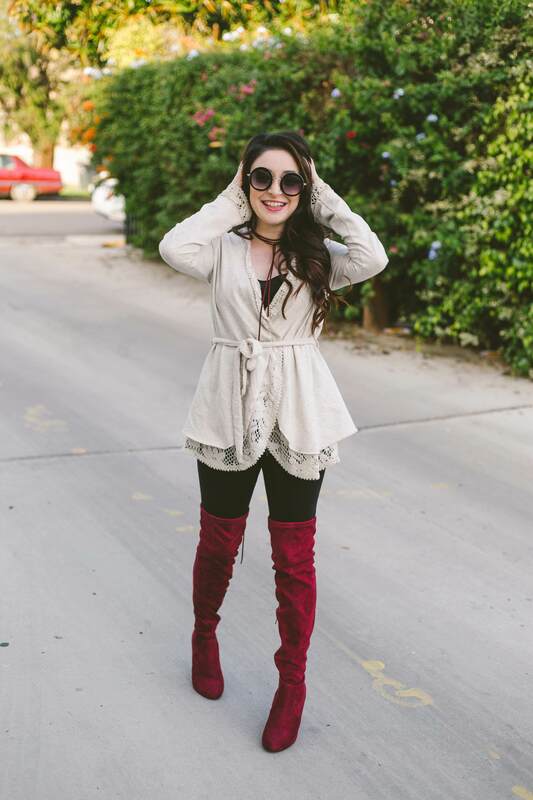 Same as yours, mine started as fashion blog, then becomes a women lifestyle and travel blog because of my growing interests on many topics. Improvements are real and its awesome! Congratulations on making to the top 78!! It sounds like you got so much out of that experience and even learned a few things about yourself and the direction of you life. Which in my book is better then winning any contest! 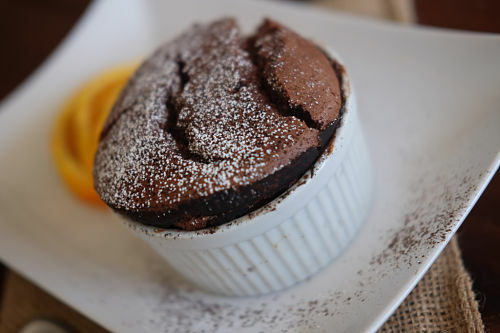 Also, this Dark Chocolate, Chili and Orange Soufflé looks so freaking good!! Oh Ive not tried making a souffle yet – I feel like it takes a bit of bravery, I’m sure mine would sink! That being said chilli and chocolate sound lovely, I think Id have to make mine on the milder side though! I am definitely going to have to try this dish out here.. I have done a cheese souffle before but never a Chocolate one. And I imagine this would be great with orange and spices. Congrats on getting as far as you did on the competition. I hope you had a great time out here in LA. Well done for making it to top78 in competition and i’m glad you were able to get a clearer idea of the vision/theme for your blog too. And it’s true…in life we are reshaped and evolve with time and that is reflected in our life’s work. The souffle looks delicious but i wouldn’t trust myself to make it! Congrats on making it so far in the competition! This recipe seems relatively easy to do for someone like me (I’m awful in the kitchen).